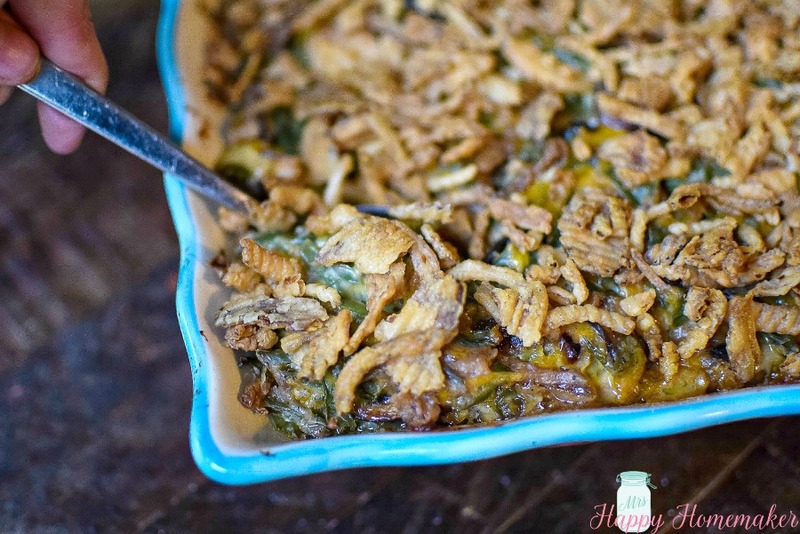 The BEST Homemade Green Bean Casserole – and it has NO CANNED SOUP in it! 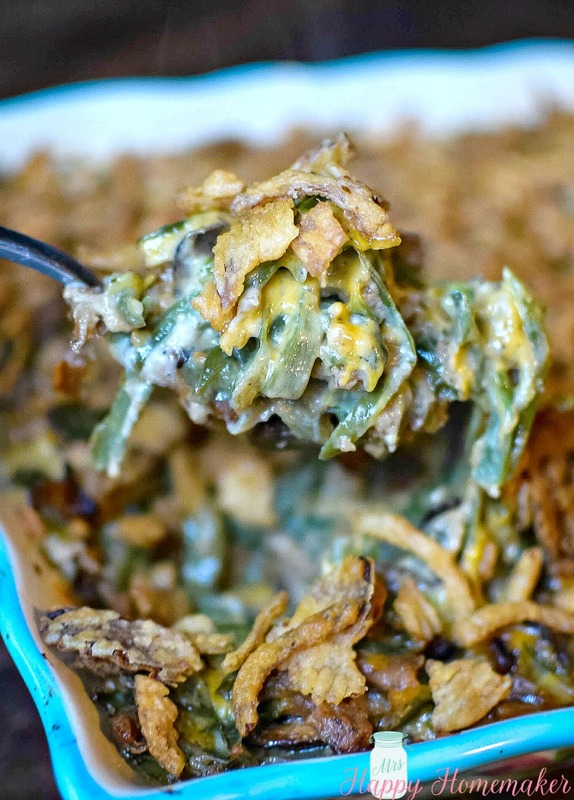 Green Bean Casserole is a standard for every holiday dinner around here & many a weeknight meal too. 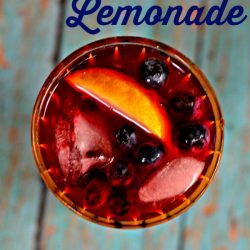 It’s one of those classics that almost everyone seems to love. Well, everyone except my 8 year old, but I’m working on that haha. I had both my daughters eating vegetables at his age with no problem, but my boy? He’s a whole different case. He can eat a jalapeño (yes, a jalapeño!) but he won’t touch anything else in the vegetable category unless I sneak it unnoticed into something he’s already. That boy is so much his father’s son. But we all know what’s good – even if the 8 year old hasn’t figured it out yet. 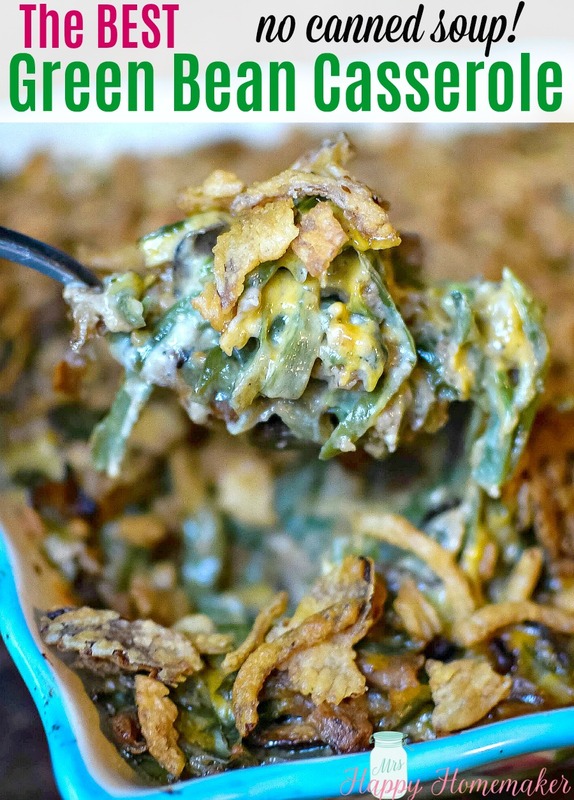 😉 Green Bean Casserole is definitely one of my favorites & one of my daughters’ as well. I really haven’t met many folks who didn’t like it. 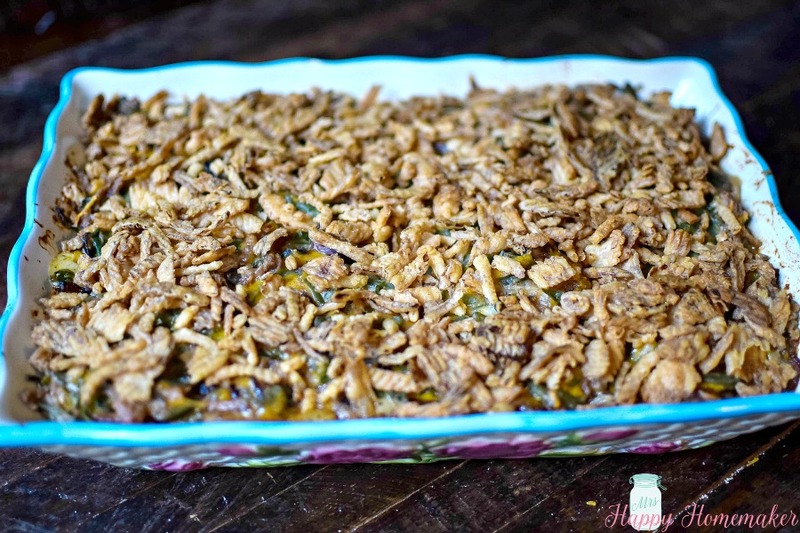 Most versions are made with canned soup, and while those taste pretty good too – I’m going to introduce you to my favorite Green Bean Casserole that tastes way better & doesn’t have one single can of soup in it. Instead of using cream of mushroom soup, I saute fresh chopped mushrooms & onion on the stovetop in a little butter (or some bacon grease if I have it, yum) & make a super simple and flavorful sauce in the same pan. The fresh mushrooms add so much more fresh flavor than the canned soup, obviously. 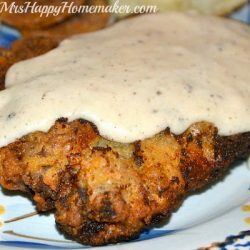 When I first tried coming up with a no-can version of this recipe, I tried plain sour cream in my sauce and while it was still good – it was just a little on the bland side. 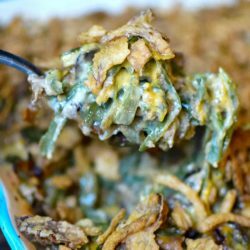 So, I tried it again and this time I had the idea to use refrigerated onion dip in it… and oh-my-word, that was the trick. The end result was absolutely perfect & I’ve made it this way ever since. It’s delicious. You can prep this a day ahead too if you like. Prepare it as the recipe states but do not put the final topping of French fried onions on top & don’t bake it yet. 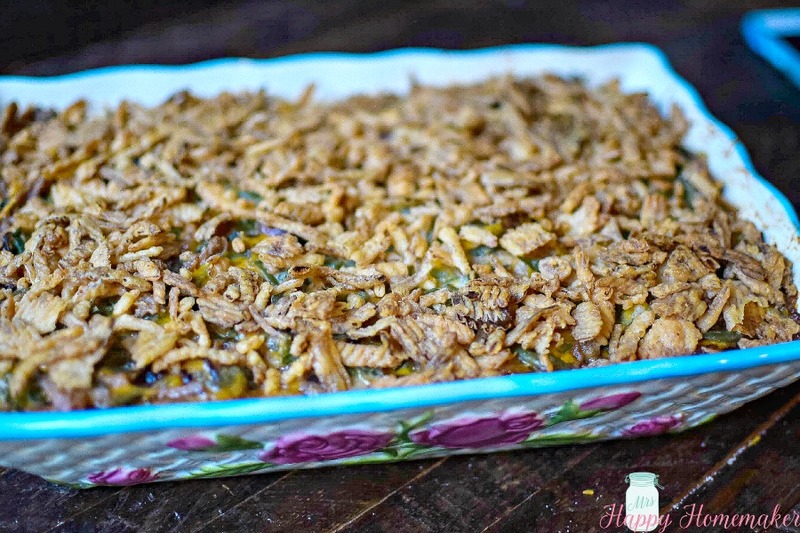 Just put the untapped green bean casserole a baking dish, cover with foil, & pop in the fridge til the next day. When ready to bake, let it sit at room temp for an hour then top with the final layer of French fried onions & bake according to the recipe. Cook the ‘steam in bag’ green beans in the microwave according to package directions. Set aside. Melt 2 to 3 tablespoons of butter in a large skillet over medium heat. Add the onion; cook and stir until onion is starting to become tender, about 5 minutes. Stir in the chopped mushrooms. Sauté until the veggies are brown & caramelized. Season with salt & pepper. Remove the veggies from the pan & set aside. Melt 3 tablespoons of butter in the pan, scraping any browned bits up with a wooden spatula. Whisk in the flour until blended & cook for about 30 seconds to ‘activate’ the flour. Whisk in milk, stirring constantly, so that no lumps form and then stir in the onion dip & garlic powder. Warm over medium heat until the sauce begins to bubble. Turn off the heat & dump in the green beans and sautéed onions & mushrooms, stirring to coat. Stir in the cheddar cheese and half of the French fried onions. Taste with a little spoon to make sure you don’t need any more salt or pepper – if you do, add it to taste. 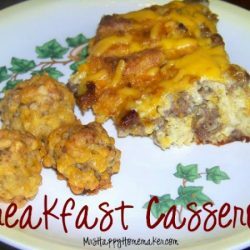 Pour into a 2 quart or 9×13 casserole dish. Top with the remaining French fried onions.